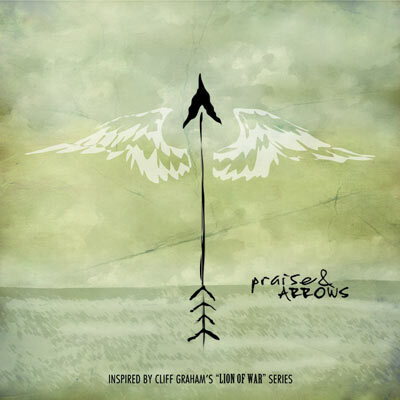 Nashville, TN (May 20, 2014) ----- Nashville producers, Aaron Rice and Mark Drury, have brought Cliff Graham's latest novel, "Day Of War," and the Lion Of War book series to life through music, with the multi-artist compilation project, Praise & Arrows. The eleven song record debuted recently in the Top 25 on iTunes Soundtrack chart, and features a diverse group of Christian artists that includes, Stellar Kart, Trip Lee, All Sons & Daughters, Pillar, Kevin Max, Audio Adrenaline, and Jeremy Rosado. The project delivers the heart and character of King David as portrayed in the Scriptures, focusing on the dichotomy of David as a psalmist and warrior. The title of the project is a reference to the Mighty Men battle cry found in the Lion Of War novels, Praise to our God and arrows to the enemy! Praise & Arrows is available at all retail and online music outlets. "Praise & Arrows is a project I will always cherish," says Rice. "I've been a fan of Cliff Graham and his entire series of books so I was honored to co-produce the album, along with co-writing a lot of the songs on the record. I'm delighted with the caliber of artists and songs, and the variety both bring to the project. Our goal was to mirror the layers and depths of David as a warrior and a psalmist, while spotlighting the mighty power and direction of God and David's faithfulness to follow Him." Praise & Arrows welcomes the much anticipated return of dc Talk's former powerhouse vocalist, Kevin Max, and the reunited original members of rock group, Pillar. Both deliver stellar performances on the album with "Cave of a Million Songs," (Max) and "The Lion Leads the Way." (Pillar). Jeremy Rosado, CCM vocalist and former American Idol finalist, delivers a moving rendition of, "Battle Cry," which is a motivational message for spiritual warriors, whether that's on a battlefield or with the difficulties of life. The record launches with Stellar Kart's powerful version of "Day Of War", and segues into Christian Rap with the title track that is delivered by Trip Lee, Canon, Derag, along with featured vocalist, Jeannie Ortega. Other standouts include strong ballads from All Sons & Daughters ("Psalm 121"), and Hawk Nelson ("Strong Enough"), while Audio Adrenaline gives a hard-hitting performance of "20:17 (Raise the Banner)." The project closes with the thought provoking, "David's Song," by People Of The Earth. For more information about Praises & Arrows please visit online: www.lionofwar.com. Cliff Graham released his first book in the 5-book Lion Of War series in 2009 with "Days Of War." It's this book that inspired the Praises & Arrows album with the gripping story of the battles of the Biblical warrior poet King David and his band of brothers, who came to be known as the Mighty Men.These warriors came to David in his most desperate hour and fought with him to claim the throne he was destined to fill. The other books in the series include; "Convenant Of War," "Song of War," "Fires Of War," and "Twilight Of War." For more info on Stellar Kart visit the JFH Artists Database. For more info on Trip Lee visit the JFH Artists Database. For more info on Kevin Max visit the JFH Artists Database. For more info on Hawk Nelson visit the JFH Artists Database. For more info on All Sons & Daughters visit the JFH Artists Database. For more info on Pillar visit the JFH Artists Database. For more info on Kerrie Roberts visit the JFH Artists Database.